[PDF] The History of Theoretical, Material and Computational Mechanics - Mathematics Meets Mechanics and Engineering (Lecture Notes in Applied Mathematics and Mechanics) | Free eBooks Download - EBOOKEE! 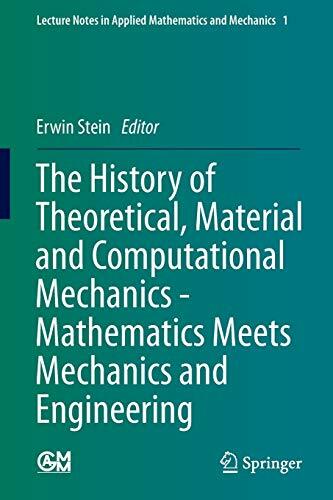 Description: This collection of 23 articles is the output of lectures in special sessions on The History of Theoretical, Material and Computational Mechanics within the yearly conferences of the GAMM in the years 2010 in Karlsruhe, Germany, 2011 in Graz, Austria, and in 2012 in Darmstadt, Germany GAMM is the Association for Applied Mathematics and Mechanics, founded in 1922 by Ludwig Prandtl and Richard von Mises. The contributions in this volume discuss different aspects of mechanics. They are related to solid and fluid mechanics in general and to specific problems in these areas including the development of numerical solution techniques. In the first part the origins and developments of conservation principles in mechanics and related variational methods are treated together with challenging applications from the 17th to the 20th century. Part II treats general and more specific aspects of material theories of deforming solid continua and porous soils. and Part III presents important theoretical and engineering developments in fluid mechanics, beginning with remarkable inventions in old Egypt, the still dominating role of the Navier-Stokes PDEs for fluid flows and their complex solutions for a wide field of parameters as well as the invention of pumps and turbines in the 19th and 20th century. The last part gives a survey on the development of direct variational methods the Finite Element Method in the 20th century with many extensions and generalizations. No comments for "[PDF] The History of Theoretical, Material and Computational Mechanics - Mathematics Meets Mechanics and Engineering (Lecture Notes in Applied Mathematics and Mechanics)".